Fjordhammer GT - The innagural event! I am running my first 2-day event! Though GT may still be more of an ambition than a fact, we're aiming high! 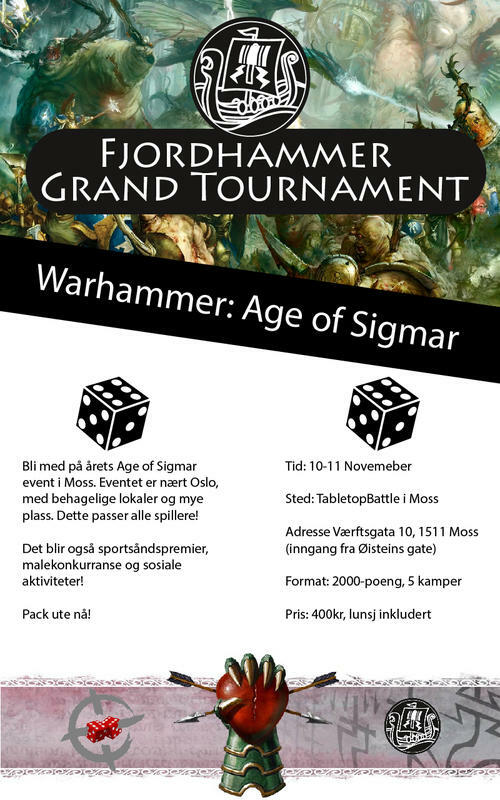 The event is being run at Tabletopbattle's locations in Moss, Norway. The date is 10th-11th of November. I am posting this event more as a heads-up than anything else. The notice has been short for any would-be international travelers. We aim to get the event up and running this year, then see what accommodations we can make for people in the coming years. However, if you would like to drop by on short notice, I will do everything in my power to make your stay a worthy one! Our event poster, in Norwegian of course!